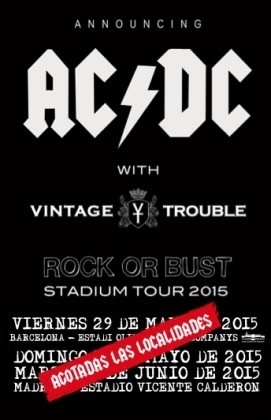 Vintage Trouble confirmed for opening AC/DC concerts in this first phase of Rock Or Bust World Tour in Europe: 6 countries and 14 dates will bring thousands of people to these shows. This won't be the first time that this band will act on big stages. They've already been opening for The Rolling Stones at London's Hyde Park, and they've also been touring with The Who in America and Europe. Fans are looking forward listening their new album, produce by legend Don was, who is also the president of Blue Note Records.